As an Owens Corning Platinum Preferred Contractor, Freedom Restoration and Roofing installs only the highest quality Owens Corning AttiCat Professional Loosefill Insulation. 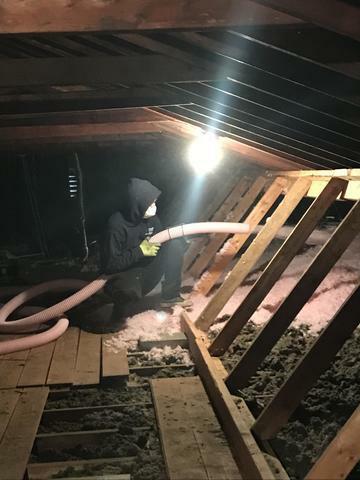 The right type of attic insulation makes a huge difference for your home's efficiency and comfort, which is why we use Owens Corning blown-in fiberglass insulation at RoofRoof. Blown-In fiberglass insulation is a highly effective material that will raise your insulation R-value to the recommended levels that your attic needs. Here at RoofRoof we use Owens Corning AttiCat's Expanding Blown-In Insulation System. We''ll send our team of experts to carefully examine and evaluate your attic so we can suggest the right insulationfor your needs. If you're interested in blown-in insulation for your home, call us today at 1-855-216-2497 or click below to get started with a free estimate. We offer all our attic insulation services in Charlotte, Concord, Rock Hill and throughout the surrounding areas. Long Lasting: Owens Corning Blown-In Fiberglass insulation keeps its energy saving R-value for longer as it doesn't settle. This allows you to insulate your home for longer. Quick: In total the job usually takes less than 4 hours (assuming 1,000 sqft attic at R-30). It might even take as little as 1.5 hours to actually blow the insulation. Safe: The whole system is fully enclosed. Best yet the fiberglass releases and expands within the machine and the system does much of the clean up for you. If you're struggling with high heating and cooling costs or uncomfortable rooms in your home, your attic insulation may be to blame. RoofRoof can help you solve these problems in your home with quality blown-in insulation installation. Blown-In Fiberglass insulation is the ideal material for attic insulation, and it can make your home more comfortable and efficient all year long. If you're interested in an attic insulation upgrade, give us a call today at 1-855-216-2497 or contact us online to get started! We offer free estimates on all our work in Charlotte, Concord, Rock Hill, Huntersville, Kannapolis, Indian Trail, Mooresville, Monroe, Matthews, Cornelius and throughout the surrounding areas.